I'm now firmly convinced not to read reviews BEFORE I go see a play. 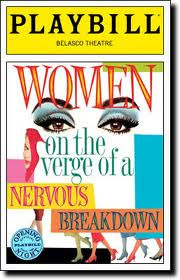 Women on the Verge of a Nervous Breakdown, the diva-studded musical adaptation of Pedro Almodovar's fabulous movie, opened to mixed and mostly sketchy reviews with almost all alluding to the "mess" that constituted this play. 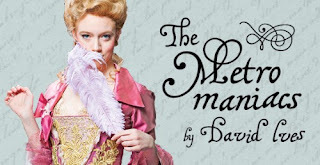 With music reminiscent of Dirty Rotten Scoundrels and lots of Sondheim, this show is a dizzying look at relationships in 80s Madrid. The cast is fantastic: there's almost too much talent on one stage, namely Sherie Rene Scott (Everyday Rapture, Dirty Rotten Scoundrels), Patti LuPone (Gypsy, Evita, Sweeney Todd), Laura Benanti (Gypsy, Nine), Brian Stokes Mitchell (Kiss Me Kate, Man of La Mancha), Mary Beth Peil (The Good Wife, The King and I), d'Adre Aziza (Passing Strange), and Danny Burstein (South Pacific, The Drowsy Chaperone, Boardwalk Empire). How can you not have a good time? Perhaps it is a bit discombobulated and you may feel like the show has ADD (as some critics have suggested), but that's part of the insane fun. Put aside that "I know good theater, and this isn't it" attitude, and enjoy! This show's a blast! I'm glad you enjoyed it. I also enjoyed Wicked -- I saw it twice. It's especially wonderful to sit up close (I won't spoil the surprises). Do you have any other theater recommendations for us? I saw Spiderman last night.